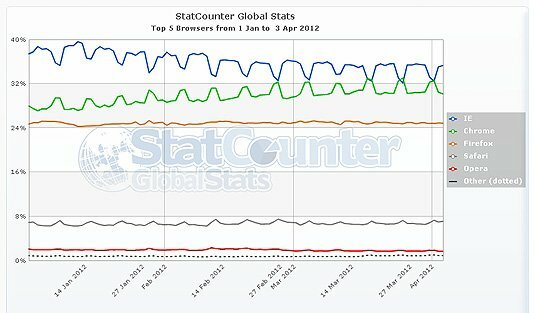 Metrics firm StatCounter reveals Google Chrome has been world's most used browser for the past three Sundays. And if the trend continues, Chrome may soon beat IE on other days as well..
Chrome's first moment of top-spot glory took place on Sunday, March 18: It held 32.71 percent of the browser market share that day, compared to IE's 32.5 percent share, according to StatCounter. The following Sunday, Chrome controlled 33.02 percent of the browser market, whereas IE held 32.13 percent. Finally, Chrome secured 32.52 percent of worldwide browser market share on April 1 (no foolin'); IE's share was 32.48. In general, going by StatCounter's numbers, Chrome has consistently seen its popularity spike on weekends over the past five weeks, while IE usage has dropped. Monday through Friday, Chrome has had an average worldwide market share of 30.16 percent; in that same period, IE's weekday's market share has averaged 35.55 percent. On the weekends, however, Chrome's average market share has increased to 32.45 percent, whereas IE's has dropped to 32.97 percent.